It’s been almost three years since the De Mars Stone Company bulldozed Noh Mul, an ancient Maya site located in San Pablo, Orange Walk. In May 13, 2013, the company razed the historic site for white marl, sparking outrage across the country and internationally. The four culprits: Denny Grijalva and his wife, Emelda Grijalva, company directors, the company’s project manager Javier Nunez, and excavator Emil Cruz, faced charges for destroying Noh Mul. On Thursday, April 21st, after eight months, the trial ended at the Corozal Town Magistrate Court, where the accused were found guilty and fined for their acts. During the trial, Chief Magistrate Anne Marie Smith stated, “When the Court visited the site of Noh Mul, it was observed that the mound was in the middle of a privately owned sugarcane field, and even lacked the stone sides frequently seen in reconstructed or better-preserved pyramids. The pyramid mound, which is about 30 metres (100ft.) tall, is surrounded by landscape which seemed to be naturally flat. However, there was THE clear demarcation of the ‘make up’ of the mound, which showed a clearly formed brick-like structure which was easily distinguished from a common pile of earth”. To Smith this was more than enough evidence to confirm the site as an archeological reserve, a key factor De Mars Stone Company Limited ignored. In the end, Denny Grijalva and Emelda Grijalva faced two charges: “removing earth from an ancient monument without a permit contrary to Section 61,” and “willful damaging of an ancient monument” contrary to Section 62 (1), (a) read along with Section 66 (1) of NICH Act Chapter 331 of the Substantive Laws of Belize, revised edition 2003, while Javier Nunez and Emil Cruz were charged with “causing the removal of earth from an ancient monument without a permit,” contrary to Section 61 of the NICH Act, Chapter 331 of the Substantive Laws of Belize revised edition 2003. The Chief Magistrate ordered the culprits to each pay the maximum fine of $1,000 and an additional $5,000 under the Laws of Belize by Tuesday, May 31st, or face a six-month imprisonment. After the sentencing, Grijalva stated that he will assist the National Institute of Culture and History (NICH) to avoid other similar incidents from occurring by placing proper signs and even fencing in areas where ancient Maya structures are located. The Prosecutor of the case, Leroy Banner, was happy with the outcome of the case, but had one exception. To better prosecute cases like these, Banner encourages the ministry to make necessary changes to alter legislation. “You cannot destroy something as important as a Maya Ruin and only be fined $5,000 or $1,000. This ministry needs to look at the law and see how they can change it,” said Banner. Director of Archaeology, Dr. John Morris also expressed his dissatisfaction with the charges. "There was a total destruction of one of the main pyramids at the site of Noh Mul. In fact, the destruction was so complete that very little could be salvaged. It was a total loss for the country, researchers, and a loss in terms of knowledge about the ancient Maya,” said Morris. For the demolition of a priceless ancient Maya temple, the Government is to be paid a total of sum of $24,000 as a criminal sanction by these offenders. But all parties agree with Banner that changes must be made to our laws to better protect Archeological Sites and increase the penalties for their destruction. “We cannot put a monetary value on the destruction done at Noh Mul, because you don't put a monetary value on a cultural asset. The laws were written back in the 1950’s and $10,000 was considered large. But today, $10,000 is a slap on the wrist. We are tabling a legislation that will increase those fines substantially. When I say substantially, I mean 10 fold or 20 fold,” said Morris. 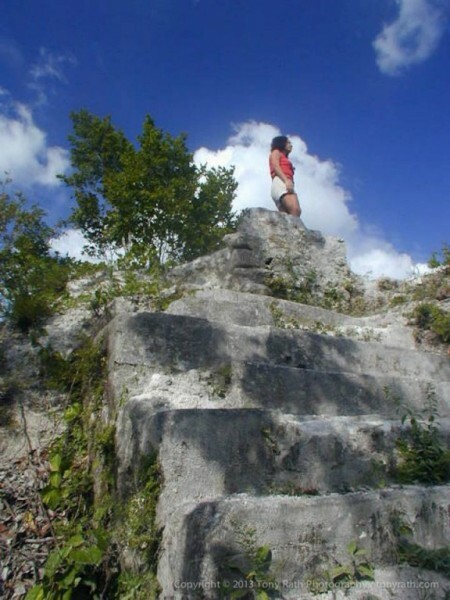 Belize has hundreds of Archaeological sites covering the entire country, with only a few having been excavated and preserved. Even if an Archeological site is found within private property, the Institute of Archaeology holds sole responsibility for the oversight and management of it.